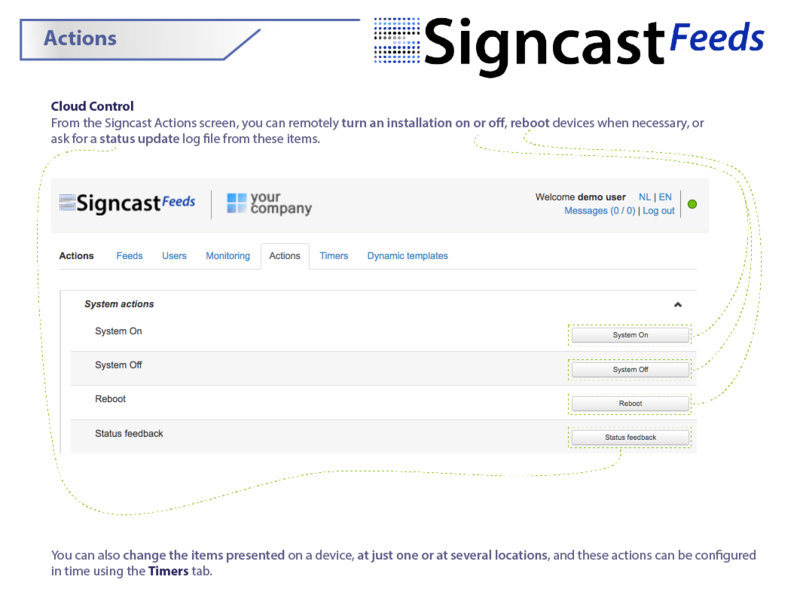 Users can send ‘Actions’ from the SigncastFeeds™ platform, using one of several protocols such as UDP, TCP, HTTP, HTTPS, Telnet, SMS, and many more. This allows for easy configuration of players, lights and other connected devices. Timers allow the user to plan the occurrence of these Actions in time. The platform can also receive commands. This is useful for logging ‘heartbeats’ or ‘proof of play’ messages from connected devices. In addition to this, ‘Triggers’ can be received that the user can connect to specific Actions, such as that when a person walks by a motion detection sensor, it triggers the display of a specific video on a player nearby. By adding bi-directional communication SigncastFeeds™ has made another step in improving our Cloud Solution. We now have our own Cloud Controller, a kind of Virtual Show Controller that can be used to setup and manage a series of devices in coordination. The Cloud Controller runs on an industrial grade / enterprise level server solution in a Dutch datacenter, and thanks to the Enterprise Cloud platform we’ve been running near 100% uptime performance for quite a while! Another benefit of this service is that it involves no depreciation. This means that both in long and short term scenarios, our solution is more stable, sustainable, and cheaper solution than the standard methods on the market. And best of all, it is already live and ready for use from the start!